In the lead-up to 2008 World Refugee Day, Project SafeCom ran a web-based letter writing campaign. We targeted Kevin Rudd and Immigration Minister Chris Evans. A week later, while hundreds of letters still flooded their email accounts, Chris Evans announced an extensive Immigration Detention Inquiry to be run for at least the remainder of 2008 by the Joint Standing Committee on Migration. We did not send a submission, confident that more than 133 other groups, individuals and organisations would act in unison in their submissions, so it was a surprise that the Inquiry's Canberra office phoned Co-ordinator Jack Smit and asked us to prepare a presentation at the Inquiry's 9 October Perth hearings. We were allocated just 20 minutes at the hearing, but because there was no prior submission, Jack used the "introductory statement" privilege of 5 minutes to rattle off the statement below, knowing that it would have to become part of the Inquiry material. Jack pulled no punches. He laid it down at the feet of the politicians without spin or niceties. This page contains the statement spoken into the Hansard by Project SafeCom, and media reports following the day's hearing in Perth, including two press releases from Greens' Senator Sarah Hanson-Young. Project SafeCom was established partially as a response to the Tampa standoff in 2001, because Tampa was not about refugees, but about politicians, and about the lengths they go to in order to win unwinnable elections. Australia does not have a refugee problem, and never had a refugee problem, but it has a political problem. It has a problem of politicians undermining UN Conventions. While we are also active in other policy and human rights areas, for today's hearing Project SafeCom is a counter-spin initiative and a platform that fiercely announces its opinions based on the underpinnings of the Convention for the Status of Refugees. Project SafeCom starts with a couple of unwanted boat arrivals inside a nation's territory: the Struma, the St Louis, the Patria and the Exodus. The Struma had 770 asylum seekers on board and was bombed after being towed outside the harbour of Istanbul by Turkish authorities. 760 people died. Turkey was happily egged on by callous statements coming from Britain, who vowed to never let the boat into its protectorate in Palestine. The story of the Refugee Convention starts with nations turning back boats that fled the Holocaust, or bombing them and sinking them, or repelling refugee boats from their shores while these same nations were at war with the regime they fled from. Once formulated, the Refugee Convention, specifically crafted in a response to boatpeople, provided for privileged entrance, reception and claims processing, and its presence in the western world eliminated the notion of "unlawfulness" and "illegality" for arrivals in countries that signed that Convention. So, in this context, Project SafeCom will declare war on any Australian politician who undermines the Refugee Convention. A politician who tries to invoke notions of "illegality" or "unlawfulness" of boatpeople who arrive on our shores with the intent to seek asylum invokes our anger and criticism, expressed quite openly, loudly and audible on every street corner, if need be. And I note that no boats with passengers trying to settle clandestinely have arrived since the First Fleet. We expect the government to invest considerable resources into telling the Australian public what our obligations are to boat arrivals and other people who seek to invoke the Refugee Convention. ... we expect our government to pro-actively inform all Australians about our obligations to those who are under threats by their governments, no matter how nicely we'd like to trade with those governments. Human Rights are not the crumbs and left-overs after our diplomatic and trade relations are on track; Human Rights are the foundation of a civil society that has fully developed ethics, and a fully developed sense of identity, national conscience and pride as a nation. Conversely, vilification of internationally agreed conventions and undermining of human rights standards towards the most vulnerable in society is a sign of Australia's immaturity, and when expressed by politicians it's something we remain highly embarrassed of. An implementation of the International People Smuggling Convention that fails to distinguish between highly organised and corrupt people smuggling rackets and a broke Indonesian fisherman from the island of Roti who gives a group of people a ride for a bit of money to sail them to the centre of their centuries-old fishing grounds: Ashmore Reef. And I'm talking about Indonesian fishermen sent broke because Australia has fiddled with their United Nations Indigenous fishing rights and Australia has failed to be lenient to these Indonesians about the borders or conditions of their UN Indigenous fishing grounds. Moving asylum seekers to Convention countries and getting paid for organising the transport is not a crime but a transport service, and Project SafeCom does not support political spin when and where politicians are unwilling to clearly inform the Australian public, and are not prepared to thank these "people movers" for bringing people to safety. It is politicians who need to carry the responsibility and the blame for Australian public opinion and for the vilification of asylum seekers arriving by boat. Since the introduction of mandatory jailing of asylum seekers by Gerry Hand in 1992, and even more so since Tampa, untold damage has been done to Australia's understanding of the status of refugees, and if politicians now just follow the polls in determining whether a policy change is politically viable or not, they will abysmally fail our country once more - because first they created vilification of asylum seekers as an official government line, in order to win elections. To now say that abandoning mandatory jailing is not viable because internal or public polling is not showing its political viability is a disgraceful continuation of a status that politicians themselves created in the first place. It was you, who created public vilification of asylum seekers, and it is you who need to create instruments that undo this damage, and only you can undo the layers of erroneous constructs in public opinion in our country. I will now move on to raise some issues in the Immigration Department, also because I will present some material from insider contacts I will not name. I will just call my contacts "whistleblower". Whistleblower may be one or more Immigration Department employees, in Brisbane or Perth or Melbourne or Sydney or Canberra or Adelaide. Whistleblower may be male or female - but whistleblower has been in senior positions for more than a decade. First, we have the extraordinary situation where just one officer of the Department sits in judgment of a refugee claim as the primary assessor. This has led to serious problems in the claims of hundreds of refugees at the primary stage. This strange one-man situation has cost Australians millions of dollars when appeals need to go to the secondary level of the Refugee Review Tribunal, where once again, a single person delivers the judgment. In 2003 Jesuit Priest Frank Brennan, then the Woomera advisor to Philip Ruddock, concluded that the Immigration Department got it wrong between 62 to 87 percent of the time in their primary assessment. Not only that. Lawyers inform us that if that Primary Assessor approves a claim, his or her decision is subject to managerial review. However if the opposite is true and the officer refuses a claim, the decision is not subject to review. A former RRT member tells us that he was told plainly at the start of his lucrative annual contract that he could not approve more than 25% of the cases that came before him. He did not stick to this rule during the year and his contract was not renewed. I ask you - if the Australian Human Rights Commission (until recently HREOC) together with representatives of Amnesty International, Human Rights Watch and migration agents, joined the primary assessor and the RRT Member, wouldn't the assessment be much higher in accuracy, saving the Commonwealth millions of dollars in court costs and even more dollars in detention costs for the duration of appeals - that often go all the way to the High Court? And, wouldn't this change save many a refugee from traumatisation to levels where they are damaged for life, as we've seen during the last seven years? The name of Greg Wallis keeps coming back amongst advocates - the Immigration Dept manager in the Curtin detention centre and in Baxter. Wallis was of course the "child smuggler" who made Amin Mastipour's 7-year old daughter vanish overnight from Baxter by deporting her to Iran, knowing full well that the little girl's imprisonment in Baxter close to her father Amin was his only ray of hope in the hell hole. Incredulously, after having been given a safe government job in Lebanon, he's back in Australia and reportedly working for the Department. In the eyes of many prominent advocates, Mr Wallis is an example of how those who behaved heinously during the Howard years are still working in Immigration without having faced an inquiry or scrutiny. It is not without reason that Project SafeCom keeps calling for a Royal Commission into the Immigration Department. I asked Whistleblower: "How many staff in middle and upper echelons would you sack if you were the boss?" and the answer of "ten people" came swiftly. "... that's too f...... late for those of us who are seeing or have been seeing shrinks!" Whistleblower tells me that at least six people have left the Department permanently because they suffered serious psychological trauma a result of their work. Members of the Inquiry, where is the open and accountable government inquiry, into what caused their psychological trauma as employees in the Immigration Department? I am being told by my Immigration Department contacts that there are serious questions to be answered - not in the past, but right now - about the allocation of tenders, about the whole tendering process in detention services, about the governance of dollars spent on detention services. "... an incident on the scale of the Cornelia Rau or Vivian Alvarez disaster is just waiting to happen...."
Members of the Inquiry, Project SafeCom is not in the business of applauding politicians, but we acknowledge some good changes since the Cornelia Rau inquiry and the start of the Rudd government, but we also have the impression that the current Minister has never met the Department without his hands being firmly protected by a set of gloves. The Department remains polluted with notions of "keeping people out" while in terms of asylum seekers and refugees it should be about "letting people in" and treating them with dignity and generosity in accordance with the UN Convention intent. Several questionable practitioners who did the dehumanising and politicized bidding under a nasty regime still find a safe haven inside its confines. Greens Senator Sarah Hanson-Young has demanded a re-think of the way Australia considers asylum seekers, with a reminder that fleeing persecution and seeking refuge is a human right enshrined in international law. Some recent media reports have stated that 'illegal migrants' have been intercepted on the way to Australia. "The myth that asylum seekers are illegal immigrants must no longer be perpetuated," said Senator Hanson-Young. "A term like 'illegals' is not only offensive, but also inaccurate. "It is not illegal to arrive in this country without a visa." Senator Hanson-Young said that Australia had a responsibility to assist asylum seekers. "As a signatory to the 1951 United Nations Geneva Convention on Refugees, and a country that considers itself compassionate and a champion of the 'fair go', Australia must step up to its international obligations and reputation and swiftly consider asylum seekers for refugee status." Senator Hanson-Young expressed concern about offshore processing of asylum seekers in locations such as Christmas Island. "The Greens and human rights organisations alike are concerned about the 'out of sight, out of mind' approach to treating people who arrive by boat," she said. "The current policy is sustaining a two-class scheme of refugees, with those who arrive by boat severely disadvantaged compared to others. "The negative physical and mental impact of detaining people in extremely remote detention centres is undeniable." Senator Hanson-Young said that the Australian Government and community should reserve their judgement on asylum seekers until their checks had been completed and they had either been granted asylum or not. "Asylum seekers who arrive by boat must be treated like any other individual seeking asylum in Australia, and undergo identity, health and security checks promptly and fairly. "While others continue to peddle a myth of fear around asylum seekers, the Greens will continue to campaign for a fairer, more compassionate Australia," she said. Senator Hanson-Young will be attending the Migration Joint Standing Committee's Inquiry hearing into Immigration Detention in Perth and will be available for comment. Greens Senator Sarah Hanson-Young's call for a Royal Commission into immigration detention, to investigate the psychological impact of Australia's immigration policies on detainees, has been backed by a leading human rights expert. 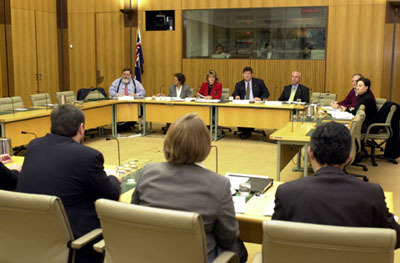 The Joint Standing Committee on Migration, of which Senator Hanson-Young is a member, today heard evidence at a Perth hearing from Curtin University's Professor Linda Briskman that a Royal Commission is required to address the negative impact of mandatory detention and to determine better immigration policies. Senator Sarah Hanson-Young said: "A Royal Commission would mean we could ensure that the abuses that have occurred under mandatory detention never happen again." "Only with the level of investigation and scrutiny a Royal Commission would bring will we see a complete picture of the damage caused by Australia's immigration policies. "The Government must commit to providing transparency and accountability on these crucial matters of human rights and justice." On 3 September, Senator Hanson-Young asked Immigration Minister Chris Evans if a Royal Commission could be set up specifically to investigate the psychological effects of immigration detention on children and their families. In response, Minister Evans said the Government was "not convinced that a Royal Commission - given the cost and the diversion of resources - would be the best way forward." Today's parliamentary inquiry hearing also heard from a number of witnesses that a Bill of Rights should be introduced in Australia to better protect human rights, including those of asylum seekers. "Introducing a Bill of Rights is a long-standing Greens policy, and as such it is encouraging that respected experts agree that such a charter is necessary in Australia," said Senator Hanson-Young. "Our country's treatment of asylum seekers has demonstrated the importance of putting in place a new legal framework for the protection of human rights. "We must bring Australia into line with the rest of the world and enshrine fundamental human rights and responsibilities in law." Senator Hanson-Young called on the Federal Government to make the necessary legislative changes to back up its pledge to create a more humane immigration policy. "Only with formal changes to legislation will we be assured of human rights being set in stone, rather than being vulnerable to abuses." The Federal Government's new refugee policy will be ineffective without laws of parliament to back it up, a parliamentary committee has been told. Immigration Minister Chris Evans says he will abolish temporary protection visas and adopt a new "humane" approach to immigration, but has retained the excision zones set up under the Howard government. The zones, including Christmas Island, where two boatloads of people have been detained in recent weeks, prevent people gaining access to the Federal Court or the Refugee Review Tribunal. Instead there will be an independent second stage of review after the Department of Immigration has made its decision. At a Joint Standing Committee on Migration hearing in Perth today, Curtin University Professor Linda Briskman said there were few guarantees the deplorable practices of the past would not continue. "Without changes to legislation, the government's policy changes are meaningless and precarious," Prof Briskman said. Labor had released little detail about how processing at Christmas Island would work, she said. The Murdoch University-based Southern Communities Advocacy Legal and Education Service (SCALES) said it welcomed Labor's changes, but the legislation from the Howard era had not changed. SCALES director Anna Copeland told the committee: "This is vital to ensure that what has happened in the past will never happen again." Ms Copeland also said it was not clear how people being assessed or due for processing at Christmas Island would be treated. A group of 17 people, including three crew, was taken to Christmas Island after pulling alongside an offshore oil storage facility in the Timor Sea this week, while a boat carrying 14 people was intercepted early last week near Ashmore Reef, off the West Australian coast. "What visas will they be eligible for? What kind of access to legal advice?" Ms Copeland asked. Retaining the excision zones and mandatory detention was "a cynical attempt to avoid our international obligations", she said. Liberal Senator Don Randall said he had serious concerns about SCALES' submission as it seemed to ignore the fact that governments need to know who arrives and who leaves the country. "You forget Ms Copeland that these are illegal arrivals," Senator Randall said during the hearing. A spokesman for Senator Evans said that, if eligible, people on Christmas Island would be granted permanent visas once processed. They would not have access to Australian legal processes of review, but would be allowed an independent assessment of the Immigration Department's decision. He said Labor's refugee policy changes would be carried out by regulation where they could, but otherwise federal laws may need to be changed. A parliamentary inquiry has heard Australia has one of the harshest immigration detention systems in the Western world. A Joint Standing Committee on Migration is holding a public hearing in the west Australian city of Perth, as part of an inquiry into immigration detention. Linda Briskman, from Curtin University's Centre for Human Rights and Education, told the hearing a Royal Commission is needed to expose the abuse of children in detention. Meanwhile, a refugee supporter group told the inquiry the mandatory detention of asylum seekers should be abolished. Refugee advocate Anna Copeland says while a new Australian government changed some of the rules on immigration detention, asylum seekers are still being unfairly treated. "These people are not people who have committed any crime. In fact they're victims of crime, they're fleeing persuction, they're fleeing torture, inprisonment, threats to their family and themselves. We shouldn't be treating them like criminals." A parliamentary inquiry into asylum seekers is being held in Perth. A federal parliamentary inquiry has been told Australia's immigration detention system is one of the most punitive in the Western world. The joint standing committee on migration is holding a public hearing in Perth as part of its inquiry into immigration detention. The refugee advocate group SCALES has told the inquiry many of its clients believe they would get a higher quality of care and better access to educational and work programs in a prison. The group has told the inquiry that mandatory detention should be abolished and immigration policy should be overhauled. Outside the hearing, SCALES director Anna Copeland said while reforms of the mandatory detention policy announced by the Commonwealth in July are a good first step, people were still being unfairly treated. "These people are not people who have committed any crime," she said. "In fact, they're victims of crime, they're fleeing persecution, they're fleeing torture, imprisonment, threats to their family and themselves. We shouldn't be treating them like criminals."